Coppicing is an ancient method of enhancing woodland biodivesity, and coppice woodlands are to be found all over Britain and parts of Europe. The key to successful coppicing is to nurture the new coppice shoots. 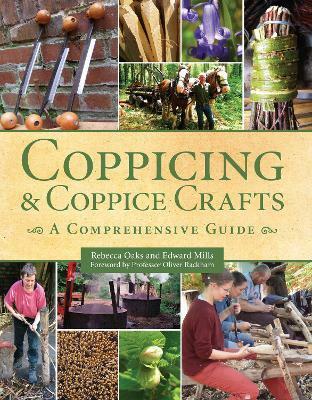 In return, a coppice will provide an endless supply of wood for a wide range of articles and the authors present detailed instruction on how to produce many kinds of woodland products from besom brooms, firewood and charcoal to more challenging items such as hazel hurdles and coracles. Rebecca Oaks set up her own coppice business in 1994. Mentored by Bill Hogarth, the last active coppice merchant in the north-west of England, she built a business specializing in hazel coppice and coppice crafts. In 2000 she formed the Bill Hogarth MBE Memorial Apprenticeship Trust [BHMAT] and has been running three-year apprenticeships in coppicing ever since. Edward Mills carried out his first coppicing in Essex in 1981. He purchased his own coppice woodland in the Lake District in 2003 and his wood is frequently used for promoting the benefits of good coppice management. Edward became a Fellow of the Institute of Chartered Foresters in 2004.